Be able to generate quarterly income tax returns for your organization (for non-individual purposes). Follow these steps in adding your 1702Q (Quarterly Income Tax Return for Corporations, Partnerships and Other Non-Individual Taxpayers) report in JuanTax. You need to make sure that you had classified your organization as Non-Individual during the setup, so that 1702Q reporting can become available in your account. To start generating quarterly income tax returns, you first need to go to your dashboard then proceed to Income Tax Return. Click the Generate Report (plus icon) to continue. Look for the year’s quarter that you need to generate a report with. After that, click the Generate button to continue. A pop-up message will appear, confirming that you had successfully generated the report. After generating your report, you’ll be prompted to the Input Summary window where you need to enter information for your 1702Q return. Note: You need to fill out the Background Information section first before you could continue with other sections of the form. Once you’re already in the Background Information section , you’ll encounter tabs such as Method of Deduction, Tax Treaty, Alphanumeric Tax Code and Registration Date. In the Method of Deduction tab, you have to choose between 2 radio buttons: (1) Itemized Deduction or (2) 40% Optional Standard Deduction. Once you have chosen your method of deduction, click the Save button to continue. A message will appear, confirming that the method of deduction in your report has been successfully updated. If your business is availing tax relief under a special law or international tax treaty, then you also have to confirm it in your tax report. Confirm this action by clicking the Yes radio button. Once you choose “Yes”, you need to specify if your tax treaty works under a Special Law or International Tax Treaty. You need to select your alphanumeric tax code from the drop down menu, as part of completing your background information. Once you had chosen your tax code, you need to hit Save to update changes in your income tax return. You also need to determine the registration date, for it is important to determine if your business is eligible for MCIT (Minimum Corporate Income Tax). Note: Concept varies when it comes to the MCIT percentage imposed on domestic and foreign companies upon its fourth year of operation. Once you had completed background information setup, you can go back to the Input Summary window by clicking Back to Input Summary button. Once you had completed background information, you may now access the other sections of the form. Next up, you’ll see the Sales/Revenues/Receipts/Fees section where you need to enter transactions that would reflect in your form. Just click the section in the Input Summary page to proceed. There are 3 tabs present in this section: (1) Exempt, (2)Taxable-Special Rate and (3) Taxable - Regular Rate where you need to enter transactions on each tab. There are multiple icons present that can help in managing transactions which would let you add, edit, delete, search and navigate transactions per page. To start adding transactions, you need to click on the Add Transaction icon. Populate fields such as Date, Reference Number, Description, Sales Type and Amount. You can also add another transaction by simply clicking the +Add Line button. To save your created transactions, click Save Changes button. You can also edit your created transactions in this section by selecting the checkbox of the transaction that you need to modify before clicking the Edit Transaction icon. Enter information in the fields that you want to edit then click the Save Changes button to update your transaction. You can also remove unwanted transactions from your list, also by selecting its checkbox and clicking the Delete Transaction icon. Confirm your action by hitting the Yes, remove this please! button. You’ll see this pop-up message which confirms that your transaction has been deleted. The next section that you need to fill out is the Cost of Sales/Service. Much like Sales/Revenues/Receipts/Fees, you still have the ability to add, edit, delete, search and navigate through your list of transactions. The only difference is that instead of Sales Type, it would show up as Expense Type, since this pertains to purchases made by the company. This section still shows the following sub tabs as well: (1) Exempt, (2)Taxable-Special Rate and (3) Taxable - Regular Rate under its two main tabs (1) Cost of Sales and (2) Cost of Services. Next up is the Other Non-operating and taxable income section, where you’ll have to enter transactions (gains or losses) which are not related to the typical operations made by an organization. The Other Non-Operating and Taxable Income section still has the same specifics as its other precedent forms. You still have the option of adding, editing, deleting, searching and navigation of transactions which works under two tabs: (1) Taxable - Special Rate and (2) Taxable - Regular Rate. Important fields present in the form are information such as Date, Reference Number, Description and Amount. The next that you’ll encounter is the Deductions section where you need to enter your business’ deductions for your desired quarter. Note: Your deductions will be composed of two tabs: (1) Exempt and (2) Taxable (Special or Regular). When it comes to “regular” taxables, it will only show up if you choose Itemized Deduction in your Methods of Deduction under Background Information. This section still has the same specifics as its other precedent forms. You still have the option of adding, editing, deleting, searching and navigation of transactions, with fields present such as Date, Reference Number, Description, Expense Type and Amount. Your tax rate is the actual percentage at which your business is taxed. For Taxable-Special Rate, you need to enter your percentage based on the number which is taxed on your business. While for Regular Rates, the value of percentage will automatically be entered, based on your Alphanumeric Tax Code entered in Background Information. You also need to enter transactions involving shares with other agencies. The data present in this field will be deducted from income taxes of your 1702Q form. This section has the specifics which are similar from its other precedent forms. You still have the option of adding, editing, deleting, searching and navigation of transactions, with fields present such as Date, Reference Number, Description and Amount which works under Taxable - Special Rate tab. This section in your 1702Q form usually appears if Normal Tax Income is higher than its MCIT. Just like in other sections, you still need to populate such fields for you to come up with this amount in your form. You still have the option of adding, editing, deleting, searching and navigation of transactions, with fields present such as Date, Reference Number, Description and Amount which works under Taxable - Regular Rate tab. In this section, you’ll also need to enter those excess credits from your previous year. You still have the option of adding, editing, deleting, searching and navigation of transactions. Be able to populate fields such as Date, Reference Number, Description and Amount. Another section that you need to fill out are creditable tax withheld for the current quarter you’re in. You still have the option of adding, editing, deleting, searching and navigation of transactions. You still have to populate fields such as Date, Reference Number, Description and Amount. If you have taxes paid from your previously amended return, then it also needs to be included to your 1702Q form. You also need to include other transactions that might affect your Income Tax return by specifying those transactions within this section. You still have the option of adding, editing, deleting, searching and navigation of transactions. Populate fields such as Date, Reference Number, Description and Amount. After that, you need to provide details with the transactions that you entered before you hit Save. JuanTax also has this penalty calculator which lets you know how much your penalties would cost once you haven’t filed your report on time. All you have to do is to click the Compute Penalty button for it to calculate your Surcharge, Interest and Compromise, based on the numbers that you provided in your form. After that, you can click on Save to update your form with the penalties calculated in this section. To complete your 1702Q return, you need to populate fields such as (1) President/Vice President/Principal Officer/Accredited Tax Agent/, (2) Tax Agent Acc. No./Atty's Roll No. (if applicable) and (3) Treasurer/Assistant Treasurer before you hit the Save Changes button. 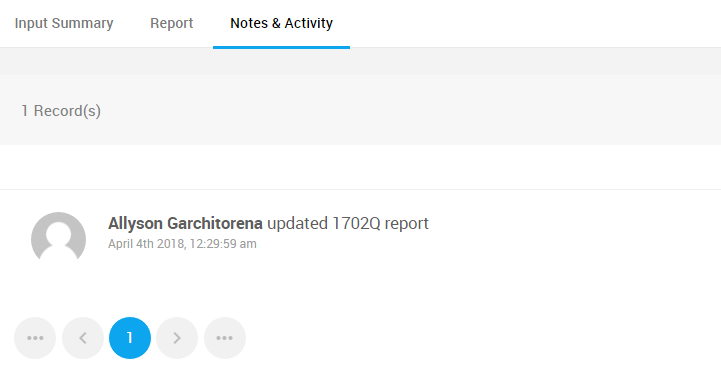 You can also access a preview of the actual report by clicking on the Report tab next to Input Summary. To see the audit trail of activities made within the report, all you need to do is to click the Notes & Activity tab. Simply file your report by following the guidelines mentioned in this article through our Help site. Follow the steps in this article for you be to able to pay your filed tax return in JuanTax.